The fun, easy way to turn ordinary desserts into extraordinary!. Is your dessert so boring, it’s left your family snoring? Not any more. Introducing The Chocolate Factory. The fun, easy way to turn ordinary desserts into extraordinary! Just place in store-bought chocolate, select your favorite treat, then simply dip it, dink it, fill it or pour it. Regular pots can burn chocolate. 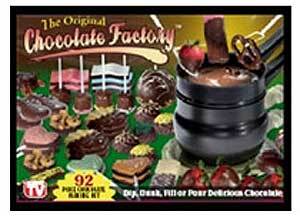 But chocolate factory’s double boiler is two pans in one. The bottom heats water while the top quickly melts chocolate into a smooth and creamy sensation. 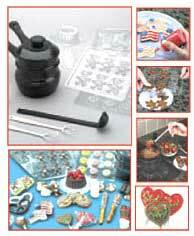 You’ll receive a Dipping Spoon which is perfect for nuts, candies or succulent strawberries. You’ll also receive the Dipping Fork which is ideal for pretzels, bananas, or mouthwatering macaroons. And the kids will love the designer molds. Snow men during the holidays; dark chocolate flowers for a bridal shower; American flags for the 4th of July. Even Teddy Bears and fancy Seashells. Make those delicous Deserts from your Own home!